In the middle of Dana's bedroom sat a doll house. Her father had made it for her. He'd hammered nails into the wood and when it was finished he'd painted it. Dana's mother bought tiny dolls to put in the doll house and tiny doll furniture. What they didn't know was that every night the dolls turned into mice. They were magic. 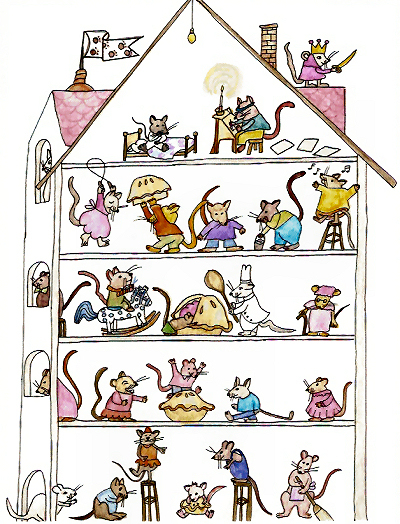 While Dana slept the tiny mice ran in and out of the doors, climbed through the windows and played on the furniture inside the doll house. As soon as the sun came up, they turned back into dolls again so Dana could play with them. One day Dana's mother gave her four tarts after supper. They were not big tarts. One might even call them tartlets. They were filled with plump, juicy cherries and sweet cream. Dana was full after eating pork pie, potatoes and peas, that she put the tarts on her nightstand and would eat them in the morning. While she slept the dolls once again turned into mice. One of them smelled the cherries and cream tarts and ran over to the nightstand. He carried them one by one back to the doll house. All night long the mice nibbled away at the tarts. In the morning Dana sat up, remembering the four tarts. When she reached for one she found all of them were missing. Her gaze moved around the room, stopping at the doll house. She climbed out of bed and sat on the floor. Crumbs were scattered all over the doll house and the carpet near it. All the dolls stood exactly where she'd left them the night before. Dana cleaned up the crumbs and ran downstairs to tell her mother and father. They didn't believe her, of course. They knew that Dana had eaten them herself and was just being silly.